Practically every comment from the flight crew started with “Aloha” or ended with “Mahalo,” but it wasn’t just lip service; everyone seemed to actually mean it. Flight attendants maintained smiles throughout the flight, and seemed to seek out ways to ensure that passengers were taken care of and happy. Small details – like the heads-up that cabin service was about to commence, and the estimate of the time it would take to complete, so that that passengers could prepare before the dreaded “fasten seat belt” light illuminated – translated into a more pleasant experience. The pilot also took the time to explain what we could see as we descended into Hawaii, effectively giving an aerial tour of ecological highlights and points of interest. Beyond the kindness, there was also a professionalism that showed itself throughout the flights. On one flight, there was – sadly – a medical emergency. The flight crew requested a doctor, announced when they would be administering oxygen, and requested all passengers to stay seated when the plane landed so that the medical team on the ground could help the ailing passenger. Though it was clearly a stressful situation, the crew was steady, calm, and kind. Yet even with all of this, what I really loved was the expectation that passengers would also treat each other kindly. As an example, when announcing meal service, the flight crew requested that passengers put their seats into the upright position, so that, “the person behind you can also enjoy the meal.” Immediately, passengers straightened up, as if we’d all pressed the little silver button on our left in precise unison. Admittedly, I no longer remember what I was flying over at this point, but I love that the pilot recognized that his passengers were likely thrilled to see the islands come into view, and took the time to acknowledge it. I’m not a neat freak by any definition – feel free to come peruse my office anytime – but I’m sometimes appalled by the way that airlines overlook the importance of an aircraft that’s been properly cleaned. Yes, yes, I know that turnaround times are brief, and on-time departures paramount, but there’s not much that’s grosser than finding a dirty Kleenex in the seat-back pocket, left by the presumably-ill passenger sitting in my seat before me. 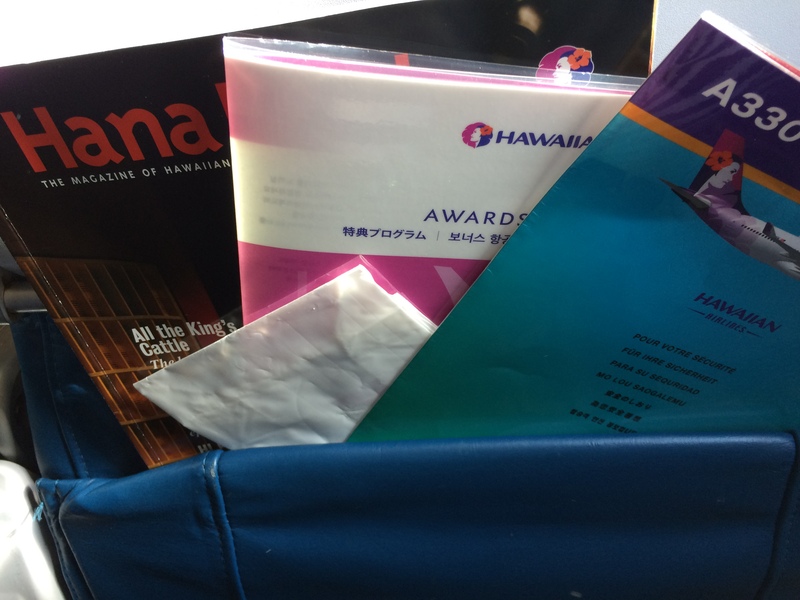 It wasn’t like that on Hawaiian Airlines; both flights I boarded were marked by rows that were, at least in this way, completely unremarkable: each tidy, with the magazine, safety card, and an advertisement for a credit card lined up neatly in that often-besmirched pocket. And, really, the seats were comfortable, reclined well, and had enough room so that I didn’t feel cramped – which is often rare in the coach seats I claim, even though I, at just over 5’ tall, am not a big person. I love me a tidy seat back pocket; the napkin was my addition. Yes, I’m a sucker for an airline that actually gives out a hot meal appropriate to the landing time of the flight. I’m even more easily swayed by free alcohol. What can I say? A complimentary cocktail (accompanied by Hawaiian-style potato chips) just before landing in the Aloha State and the offer of wine at no charge to round dinner out on the way back to the mainland is a nice touch. Plus – and I realize this is actually just brilliant, well-placed marketing – the coupon for a free Photo Book from Shutterfly for each passenger means that I might actually do something with the 500+ pictures I took in a mere week. I can’t imagine that any of this costs the airline all that much money, and in that way, I like it even more: not only does it mean that smart people are running this show, it also means that they prioritize the happiness of their customers. I chose white for my free dinner bev. Years ago, I was on a flight that was delayed for almost three hours – before an international, six-hour flight – on the runway. The plane was freezing. When I requested a blanket, though, the flight attendant announced, loudly, that the blankets were reserved only for first-class customers; thus, I did not qualify. It was embarrassing, weird, and kind of rude, and it’s something I remember about that airline even now. My experience on both flights on Hawaiian Airlines could not have been more different than that grumpy flight attendant. On the shuttle to the airport for the flight to O’ahu, we met a flight attendant named Gabby. She chatted with us and mentioned that she was working on our flight, but it turned out that she was not in our section. 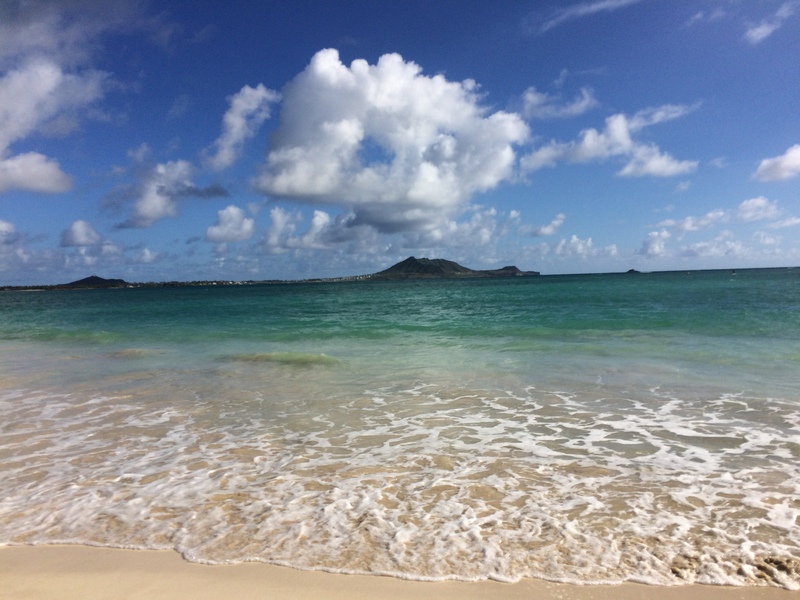 No matter: when we landed in Honolulu, she had a full page of recommendations ready for us that she’d compiled with a colleague, along with the best of wishes for a great week. On the way back to California, it turned out that the dinner being served was not vegetarian. 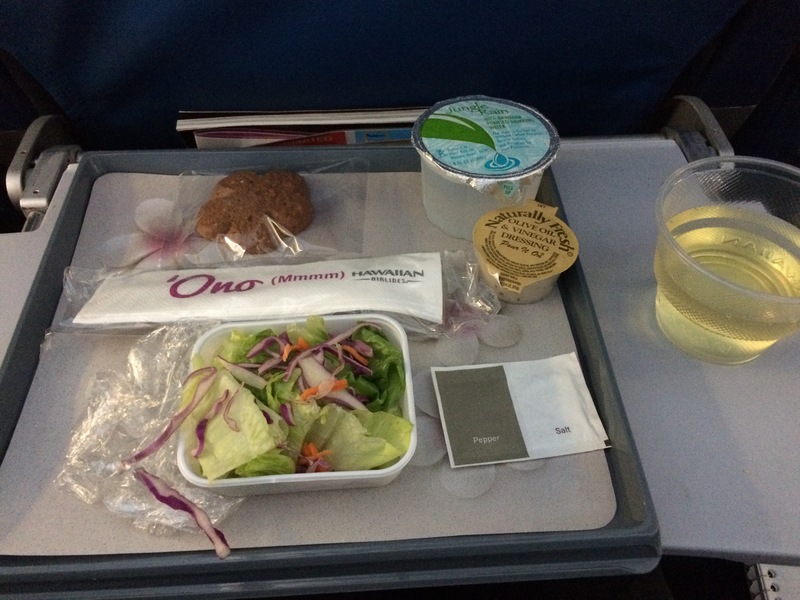 The flight attendant – Brian – asked me if I’d still like it, as there was a salad and cookie on the tray as well. I took the dinner and ate what I could. A few minutes later, after he’d finished delivering meals, he reappeared, another salad in hand, asking if I’d like some more to eat. I was touched that he remembered who I was, and where I was sitting, and that he had the generosity of spirit to imagine that I might still be hungry. 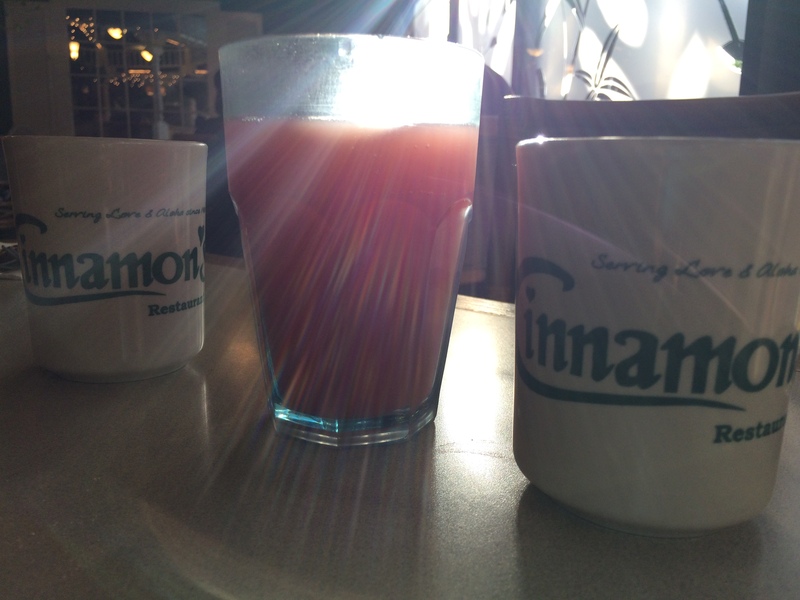 Gabby, you were right: Cinnamon’s was the perfect treat after a sunrise hike to the Lanikai pillboxes. Ok, admittedly, Hawaiian Airlines doesn’t actually have any power over this, but – though the company flies to many different destinations – I can almost guarantee that when I step off the plane, I’ll be in paradise. And that’s a happy association, indeed. I mean, really. I can’t imagine not feeling enthusiastic, knowing that this is where I’m headed. For the first time in a long time, I can say that I really enjoyed an airline, and that I can’t wait to fly again. That’s no small feat, HA. Many mahalos to you and your team for such a great experience. I’ll look forward to seeing you soon. 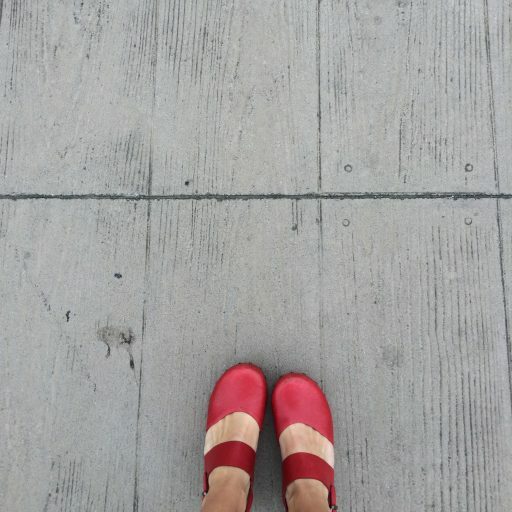 This entry was posted in Gratitude, Travel. Tagged airline, aloha, beauty, customer service, Hawaii, Hawaiian Airlines, kindness, kudos, Lanikai, mahalo. 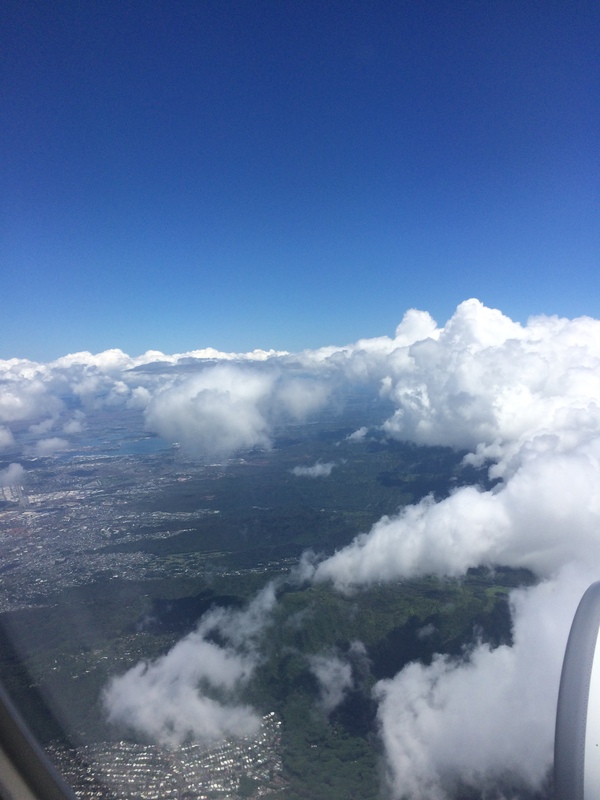 I am right with you… Hawaiian is the only way to fly, best seats, comfort and above all best service. So glad to hear that I’m not the only one! Such great service definitely deserves some public celebration. Yay! Lucky you to live in such a beautiful place! Aloha!